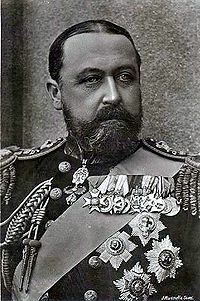 English: HRH Alfred, Duke of Saxe-Coburg and Gotha (Alfred Ernest Albert; 6 August 1844– 30 July 1900) was the third Duke of Saxe-Coburg and Gotha reigning between 1893 and 1900. He was also a member of the British Royal Family, the second son and fourth child of Victoria of the United Kingdom and Prince Albert of Saxe-Coburg and Gotha. He succeeded his paternal uncle Ernst II, Duke of Saxe-Coburg and Gotha as the reigning Duke of Saxe-Coburg and Gotha in the German Empire on 23 August 1893. On 23 January 1874, the Duke of Edinburgh married Her Imperial Highness The Grand Duchess Maria Alexandrovna of Russia, the second (and only surviving) daughter of Alexander II of Russia and his wife Marie of Hesse and by Rhine, daughter of Ludwig II, Grand Duke of Hesse and by Rhine and Wilhelmine of Baden, at the Winter Palace, Saint Petersburg. Media in category "Alfred, Duke of Saxe-Coburg and Gotha"
This page was last edited on 13 March 2019, at 11:06.